The media revelation earlier this month, that the accused in the highly controversial, T.P. Chandrasekharan (Revolutionary Marxist Party leader) murder trial, were social networking from their prison cells, spurred yet another round of political hue and cry in Kerala. On questions at the abhorrent lack of discipline in the State’s prisonsbeing raised, the Kerala Home Minister, Thiruvanchoor Radhakrishnan, eager to save his face, quickly pacified everyone with assurances of taking immediate steps to avoid lapses in jail security. It is said that the Government is even considering installation of sensors and jamming devices (already in place in several prisons across the State and rest of the country) to prevent recurrences. But politics aside, what really is the extent of prisoner’s rights to communication in India? But before, we examine the scope of these rights, it may be relevant to first have an over-view of the structure and the mode of regulation of the laws concerned. At the national level, besides the Constitutional guarantees, the matter is largely streamlined by the Prison Act, 1894, the Prisoner’s Act, 1900 and Rules thereunder. The State Governments are vested with rule making powers under these Acts. The different State Governments have, in addition, contributed to the corpus of law through Jail Manuals, and certain State Legislations (prison were made a subject for State Legislation, post Government of India Act, 1935). Evidently, the statutory laws being archaic, they are at most, a diluted notion of the principle that the best criminal code can be of a very little use to a community unless there be a good machinery for the infliction of punishments- “Deterrence was the basis of the concept of Prison” (VidhyaBhushan, Prison Administration in India, p. 20). Though Lord Macaulay introduced prison reforms for the first time in India, as early as 1836, the Prisons Act, 1894 has hardly undergone any substantial change, since the time of its inception, more than a century ago. Nevertheless, this is not to say that the critical evaluation and study of the prison system was at a standstill. The modern reformist movement, with the shift to ‘reformation and rehabilitation’, which can be said to have begun with the Indian Jail Committee, 1919-1920,were taken forward by the Mulla Committee, 1980, Justice Krishna Iyer Committee, 1987 etc.,and they havemade several recommendations. It may however be noted that, the Model Prison Manual, 1960, which was the guiding principle on the basis of which the present Indian prison management is largely being governed was presented by the All India Jail Manual Committee, 1957. Most recently, the Model Prison Manual, 2003 suggested by the Committee appointed in 2000 by the Home Ministry, Government of India, has taken its place. Reforms are being initiated on its basis in various states as an endeavourto bring Indian prison management in tune with international standards i.e., The United Nations’ Standard Minimum Rules for the Treatment of Prisoners. But thankfully, in stark contrast with the stagnant state of the legislative framework, the Indian judiciary has, over the years, taken a pro-active step in safeguarding the rights of the prisoners. It has held that the prisoners are also entitled to all the Constitutional rights, unless any of them have been specifically curtailed by the Constitution itself. It is settled in law today, that merely because of conviction, it cannot be said that a person is stripped of all his Constitutional rights. In D.B.M. Pataki v. State of A.P., it was held that, a compulsion under the authority of law to live in a prison-house, does entail by its own force, the deprivation of fundamental freedoms like the right to move freely throughout the territory of India or the right to “practice” a profession. But that does not mean that he/she is divested of certain other fundamental rights like the personal right, guaranteed under Article 21. Coming back to the question of extent of prisoners’ right to communication, drawing analogy from the aforementioned dicta, it followsthat, subject to considerations of ‘search, discipline and other security criteria’ (Sunil Batra v. Delhi Administration), the rights of the imprisoned (whether civil, under-trial or convicted criminal prisoners) cannot be abridged. The Prison Rules of almost all states of the country are similar in terms of permitting communication through letters, direct interviews with family, friends and legal advisors, and even phone calls, though subject to certain conditions on aforementioned grounds. In fact, the Supreme Court in Sunil Batra’s case, opined that, “visits to prisoners by family and friends are a solace in insulation; and only a dehumanised system can derive vicarious delight in depriving prison inmates of this humane amenity”. Thus, liberal visits/ interviews by family members, close friends and legitimate callers, were held to be part of the prisoners' kit of rights. Even press and media persons are brought within the ambit of ‘friends’ by the Apex Court, and thus cannot be denied the right of an interview (Prabha Dutt v. Union of India). Therefore, the rationale behind the restrictions imposed on the prisoners is merely the maintenance of internal order and discipline within the jail, prevention of escape of prisoners or the transmission of communications which have the potential to disturb public order, or inspire commission of any illegal activity/offence. In this context it may also be relevant to note the Madras High Court decision inValambal v. government of Tamil Nadu, (Mad. ), where the censorship of the letters addressed to the prisoners and the monitoring of interviews by a special branch of police and the attempt of the authorities to obtain the list of close relatives and bona fide legal advisors was challenged. The Court declared such procedures as illegal and insisted that jail manual should be strictly followed in the matter of communications and interviews with the prisoners. Thus, even in the so called traditional methods of communication, the High Court drew a line at the maximum permissible level of scrutiny and interference, beyond which free communication cannot be curtailed. But, as of date, the introduction of internet or modern technological devices are seen by the authorities with a wary eye. ‘Security issues’ are cited as the over-whelming concern. Bu really, though providing access to social networking sites may be taking the idea too far, is the complete and total denial of access to modern communication devices justified? It may be recollected that the sole reason for the trial court in Delhi to reject, in 2011, the use of iPad in jail by Asif Balwa, an accused in 2G Spectrum case, was in light of its ‘possible’ use as a communication device. But if scientific development is able to somewhat overcome, the hitherto practical impediments in the enjoyment of these other rights while in incarceration, can it be forcefully deprived merely to maintain status quo ante? How much more of a security threat is posed through them, than a simple letter or face-to-face communication or even a phone call?Is there any intelligible differentia? Surely, the Governments cannot plead its naivety to effectively circumscribe the misuse of these e-resources and to strike balance between its use and the check of admissible apprehensions, especially given the recent revelations of the rather extensive and questionable monitoring being done over the citizens, attesting to the capabilities of governments today. Several countries like the Norway, the U.S (albeit limited to the Trust Fund Limited Inmate Computer System, which allows monitored text messaging), parts of Australia etc. allow usage of internet in prisons. Besides, being an important source of education, it is considered healthy for rehabilitation and essential to ensure re-integration to modern society. 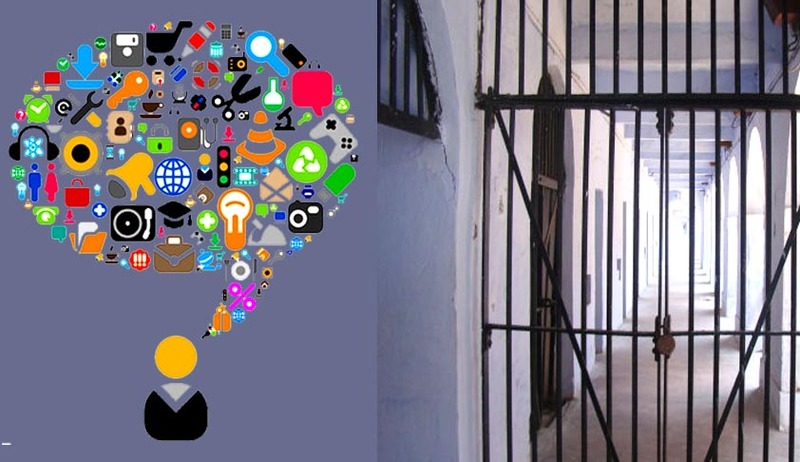 Very recently, in the UK also, the joint Prison Reform Trust and Prisoners Education Trust report said that “secure, controlled use of the web can also transform education, family contact and resettlement in jails”. Admittedly, in the present scenario, ‘introducing prohibited article contrary to any Rule’ is a prison offence under Prisons Act, 1894 and the Kerala Prisons and Correctional Services (Management) Act, 2010. Section 42 of the 1894 Act specifically states that whoever introduces or removes any ‘prohibited article’ into or from a prison, or makes an attempt thereof commits a prison offence under that Section. The section also penalises any officer who knowingly suffers the commission of such act, any person who so communicates or attempts to so communicate with the prisoners, and one who abets an offence under this provision. Therefore, interestingly, the prisoner himself only falls into the final category of anabettor. The superintendent of the jail has the prerogative to punish the offenders or refer the matter to a judicial magistrate, as the case may be. However, though sensationalism behind this instant case in Kerala has brought much attention to this sad state of affairs, it is not an isolated incident. The lack of infrastructure and human resources (officials) to manage prisons in our country, has led to a situation where prison officials are themselves, openly accepting the rampant use of mobile phones ‘illegally’ within the prisons across the country. This kind of reckless disregard, may be attributed to overcrowding of prisons (NCRB Report, 2012 shows total occupancy rates in prisons as 111%), prisons being acutely under-staffed (NCRB Report, 2012 shows only 2863 officers in the rank of Dy. SP/Jailor/Dy. Jailor/Asst. Jailor/Asst. Supdt., against a sanctioned 4425 officers in number) or corrupt and collusive officers. Whatever be the reason, of the several counter measures devised to curb this issue, quite ironically, some of them have turned out to be ‘boons in disguise’ for the prisoners. Set up with a view to ease the monitoring of these illegal phone calls and the burden of setting up meetings for the inmates, some Governments in the country are already on the move to allow inmates to make phone calls to relatives or anybody else of their choice, from landlines within the prison, at their own cost. But the authorities need to treat the ‘cause’ rather than merely suppress the symptoms. Open prisons are one such avenue, the Government can explore more. Open prison is a concept wherein prisoners are not exactly locked-up in their cells, but are employed in other activities-agricultural, industrial, construction etc. They are also under relatively less stringent security and restraint. Currently, out of a total of 1394 jails in the country (as per NCRB Report, 2012), only 46 are open jails. Open prisons have also been recommended with approval in 2003 Model Jail Manual, which provides for Open Work Camps, Semi Open Training Institutions and Open Training Institutions and Open Colonies, with varying degrees of freedom. After serving a minimum sentence in traditional closed prisons, and on record on good behavior, non-habitual prisoners may be transferred to such establishments. Appropriate work is allocated to improve habits and work skills, together with cultural and educational levels and vocational skills. They are paid better wages than in a closed institution, and are encouraged to have better contact with family members, to the extent that open colonies even allow housing the prisoners’ families within it. This system is not only ideal for reforming and reintegrating the prisoners, but helps reduce the over-crowding in jails. Privitisation or out-sourcing of prisons could provide yet another course of reprieve for the over-crowded under-manned prisons in our nation. Several countries like the US, the UK, Australia etc.have already successfully established this system. Though the Government would still retain the security and control of the prisons, its management and running is handed over to private entities, who seek to use the labour of the prisoners. However, the system is not without its flaws, as the profit motive of these organisations, often drive them take cost cutting measures that may adversely impact prison conditions. Israel is said to have dropped the idea on this grounds. However, whether with proper regulations and standards, this system will be a viable option given the present requirements of the country, is a policy decision to be made. In any case, going by thereformist notion of imprisonment, the greater the facilities for correspondence and social participation, the greater is the chance for reformation of the offenders. Thus, any further policy framework in prison laws, the government should prioritise the prisoner’s rights over manageable security concerns. Anagha Lakshmy Raman is currently pursuing 4th year law in the National University of Advanced Legal Studies (NUALS), Cochin.